FSI Sniper 6-24x50mm Scope Review - A Great Yet Affordable Rifle Scope! Many years back, people used knives, bows, and spears to hunt. Some people still use them today but with the improvements in technology, many hunters choose to use rifles and scopes for hunting. If you are serious about hunting, you understand the importance of scopes when it comes to hunting. A scope not only improves your vision, accuracy, shooting confidence but also but also boosts the range of your rifle. If you are looking for the right scope for hunting, the FSI Sniper Scope will be a great addition in your hunting gear. The scope is reasonably priced and has features every hunter would appreciate. Let's find out more about this hunting scope. 100, some user says it is more than 500! A good hunting scope should handle outdoor weather conditions so that it can serve you for many years. This hunting scope can handle recoil from larger rifles, thanks to its rugged chassis. It is designed with nitrogen-filled barrels and the lenses are sealed with O-rings which make it durable. The scope is glare, water, fog and reflection resistant. You can depend on it for the best results even when you are using it the whole day. It is easy to adjust the objective optic from the front especially if you are struggling with image clarity. You can adjust it manually to meet your requirements. People who have a less perfect sight can benefit a lot from this feature because they don't need to wear glasses so that they can get a good image. You can easily optimize the accuracy and clarity without problems. This scope also has variable power settings that make it ideal for target shooting at long range. The scope has three illumination options which include blue, red and green colors. It provides users with a field of view of 100 yards which helps you get accurate shots when hunting. It features ball bearing turrets for easy adjustments. The turrets have a click value of ¼ MOA and the ball bearings provide an easy operation. Additionally, the elevation and windage turrets of the scope are lockable giving you the opportunity to select the right settings once you dial in. Many shooters experience problems when it comes to recoil. This is why the manufacturer provides you with a quality scope that is recoil tested. According to the test, this scope can handle the recoil that is produced by high-end rifles. This scope is perfect for long range target shooting. It has a variable power setting of 6-24x so you can depend on it for excellent results. Additionally, it also has a large 50mm objective lens for better so you need perfect rifle clearance. Once you buy the scope, you will also get other accessories included in the package. It comes with mounting rings, scope caps, and an extended sunshade to reduce glare when it is too bright. Q: Does this hunting scope feature a zero reset turret? A: Yes it does. It has an Allen wrench that helps you to loosen or adjust the windage and elevation knobs to zero. Q: Is this scope perfect on .22 rifle? A: The scope will work well provided the rifle has the recommended rail system. Q: Does the scope need a battery? A: If you want to illuminate blue or green, the scope will require a battery. In case the battery power dies, it still has a reticle to help you see. Finding a quality scope that provides you with excellent features at this price range is hard. This is why many hunters love the FSI sniper scope. It provides accurate results even for long range target shooting. 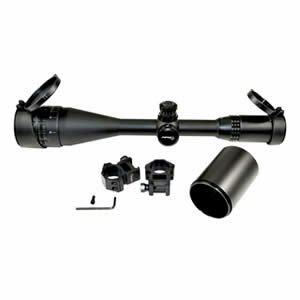 The scope also features a durable construction for longer outdoor use. Is as much as it has some flaws, this scope still remains the best option for people a superior performance without spending too much.